I’m often asked where my ideas come from. To be honest, food is on my mind pretty much all day. Most of the time, as I sit and drink my morning coffee an idea will hit me and I begin baking immediately. If I can’t bake immediately, I jot down the idea, somewhere. I’m not like those other food bloggers who take the time to write out a recipe first, I grab a pencil and paper WHILE I am creating a recipe. Honestly, there are times when I wish I was a little more organized in my recipe writing. Absolutely. My desk is covered with notes of ideas, half written recipes, full recipes and scraps of magazines. But, at the end of the day, when dinner has been cleaned up and we begin eating our dessert, it makes it all worthwhile. Especially when it comes to this recipe. 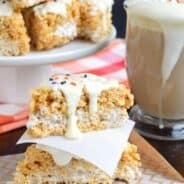 I knew I wanted to make Rice Krispie treats, because as I’ve mentioned before, they are my favorite! I’ve pretty much perfected how to make Rice Krispie Treats. This version is easy and amazing. And I am going to go one step further and encourage you to have them for breakfast. YES BREAKFAST. My kids love sliced bananas in their cereal, so go ahead and have one. I drizzled chocolate on a few too, which was a delicious touch! Enjoy! Butter a 9inch square baking dish. Set aside. In large pot, melt margarine on medium heat. Add in marshmallows and stir constantly until completely melted. Remove from heat. Fold in pudding mix until fully combined. Fold in cereal. Immediately pour cereal into prepared baking dish. Using buttered fingers, press treats into (don't over press or they get hard and dry tasting). Allow to set 20 minutes or more before cutting and eating. Enjoy! I laughed as I read this…I do the same thing when I write recipes! I have scraps of paper everywhere with jotted down recipes and recipe ideas. You mean you are supposed to write the recipe down first??? No way! I am just like you…as I add stuff in my bowl, then it goes on the paper!!! Love how much we are alike in these funny little things:-) You should see how many scraps of paper with recipe ideas I have. And pudding in rice krispie treats…yuuummm!!! You just opened up a whole new world to me of ideas!!! Of course the chocolate drizzled on top would be a sure thing for me! Oh my, pudding mix? Will HAVE to try these and see how this is. Sounds delicious! I do the same thing when modifying/creating a recipe. Who needs to plan ahead, right? I don’t plan much, either most times and love your comment about when you grab the pencil and the scraps of paper. I can relate. These look so gooey and PERFECT! This looks so yummy!! I would love if you could link this up to my weekly I Love Fridays party. I think my readers would really appreciate this recipe! Have a great weekend! This is SUCH a great idea! And homemade tastes so much better than the store-bought. I am loving this rice krispie thing that you are on. Banana flavor is so brilliant! Oh my gosh – are you serious? 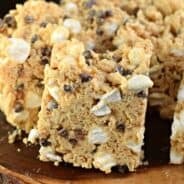 You can put pudding mix in rice krispie treats? Oh man, this could be very very dangerous. I will definitely try the banana flavor first. 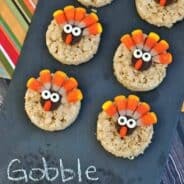 Found you on Sweet as Sugar cookies party and these look and sound good! These look amazing! Must try these out. This is so smart! I love bananas on my morning cereal too, so clearly, why not in rice krispies! PS: I’m fairly certain I’m always thinking about food too…and that there are recipes ideas scribbled down all over my life! Im afraid that if I made this.. I’d eat the whole batch… no.. 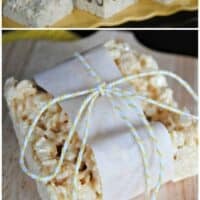 I think I’d best abstain.. Rice Krispie Treats are my favorites too.. sigh. These are genius … just had to share them on FB today!! 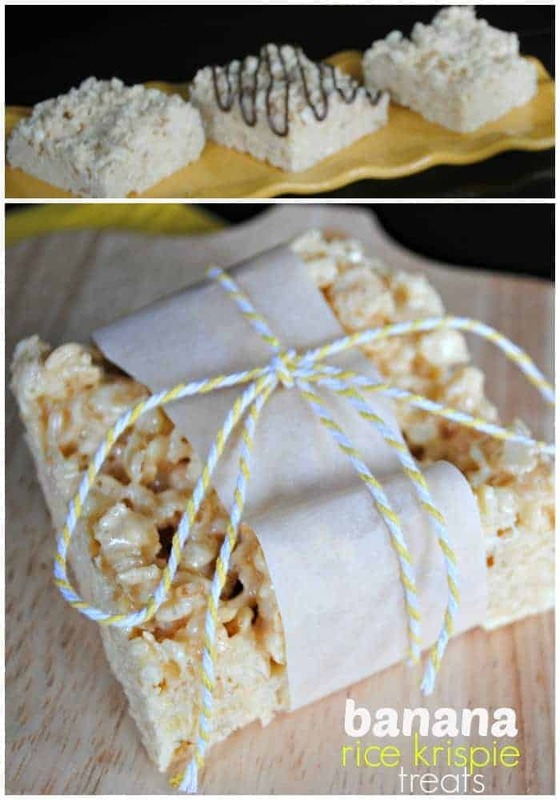 Being a Rice Krispies Treat fanatic, these look awesome. And I love all things banana. I do the same–make up recipes as I go and don’t write them ahead of time. Just made these tonight! But I added sliced banana pieces and chocolate drizzle on top! Yummy! Yes, that sounds like the same thing. It’s instant pudding that you mix with milk and chill. Except you wouldn’t do that, you would just add the Angel Delight to the marshmallows. A typical American recipe. I came here hoping to find a recipe to use up some bananas but rather than use actual banana flavoured bananas you use a prepackaged pudding mix. Is it any wonder obesity levels are so high in the US? Thank you? I am a typical American mom, and I believe everything in moderation. I am healthy as are my children, and we prefer to eat our bananas for breakfast and enjoy these as a treat. Hi! This recipe sounds great, but I have a silly question…. for the pudding mix do I actually prep it or just add the powder as is to the melted butter? I am developing some “adult” Rice Krispies Treats for our 25th anniversary party. Today I made Bananas Foster Xango RKTs with browned butter. And banana flavoring…. BEFORE adding matshmallows. It was a disaster- the pudding turned into a glob of pudding powder plastic in a pool of melted butter! Moral of the story: ADD PUDDING POWDER AFTER MIXING IN MARSHMALLOWS. I started over. Browned butter. Added 1/4 cup brown sugar. 2 tablespoons banana rum ( bought mini bottles for experiment). Will add 1 to2 more t as blespoons next time. Added 1.5 teaspoons banana flavoring Then marshmallows. I used 4 cups of Rice Krispies and 3 cups of Cinnamon Crunch Cereal partially crushed. (Walmart cinnamon toast cereal). After cooking drizzled with melted Ghirardelli milk chocolate and Ghirardelli caramel chips layered with crushed 1 cup coarsely crushed Cinnamon Crunch and 1.5.cups dried banana chips. Tasted FAB but drizzles and toppings didnt stick on well. Next time will skip toppings and stick to drizzle AFTER cutting bars first. Family thought they were great. Husband said they were better than previous maple bourbon brown butter BACON RKTs!??? ?